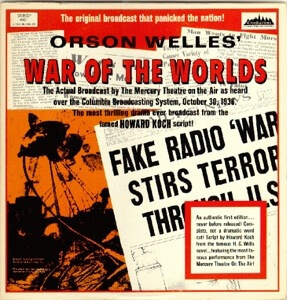 The New York Times reported “Many Flee Homes to Escape `Gas Raid From Mars’–Phone Calls Swamp Police at Broadcast of Wells Fantasy” and the story of the hoax is firmly embedded in the history books. But the reports of streets full of panicked citizens don’t hold up to scrutiny. Welles himself certainly had little reason to correct exaggerated reports of crowds driven to the streets by his creative efforts. The Slate article criticizes a PBS documentary that uses actors to portray panicked citizens (apparently because there isn’t any historical footage, and people watching at TV documentary about a radio show have to be able to look at SOMETHING). Ironically, what began as the newspaper industry’s gleeful attempt to demonstrate the untrustworthiness of radio news has created a myth that, according to Slate, is happily perpetuated by members of the broadcast industry who want to establish the power of broadcasting, and by members of the government who want to establish the important role that the government should play in the management of media. 30 Oct 2013 in Culture, Drama, History, Journalism, Media. There’s a really interesting article about this (which I will dig up if you want—I teach using it in Intro Media Studies). Someone did a study of it while people who listened to the broadcast were still alive. Many people reported being scared by it, but just about nobody “fled their homes,” and most people who were frightened dropped in on the broadcast at a certain (very believable early) point, switching channels from elsewhere. Really, nothing different than you’d expect from any hoaxy TV show today. I’m teaching a “Media and Culture” class next term, so yes, I’d love that citation.